No, you’re not seeing double – this novel has been acclaimed previously by the Hoarders. Last year, Penny wrote a lovely review of the tale, which you can read here. I myself was patiently waiting for the audiobook, having heard that the story is even more engrossing thanks to the voice talents of the author Khaled Hosseini, and his fellow narrators Shohreh Aghdashloo and Navid Negahban. I put a hold on one of the audio copies at my local library (I believe I was 86th in line – is that all? ), and kept checking my inbox for the notification. Once in my possession for those precious few weeks, I learned quickly that it was well worth the wait. And The Mountains Echoed is heartbreaking and gorgeously written. This is a novel that boasts some of the most elegant prose that I’ve encountered in a very long time. Hosseini’s words are silk. Each line is more poetic than the last. Having those words read aloud to me was like listening to a melancholic lullaby, and I was left drained at the end. 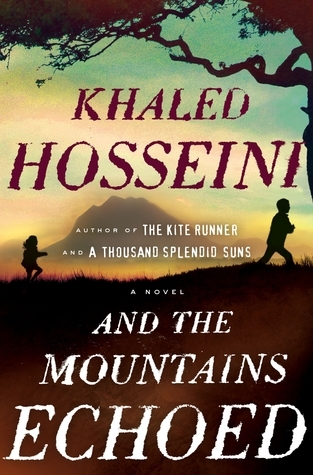 This was my first experience with Khaled Hosseini’s work, and I now fully understand why this author has such an enthusiastic and devout following. And The Mountains Echoed wrapped itself across continents and generations, and offered a surprising number of rich characters. The sprawl of the tale was almost dizzying. The book opens with some lore; a haunting children’s bed time story that would keep most awake until the wee hours. You would do well to pay close attention to these pages, as the story succinctly sets the tone for the rest of the novel. This sober bedtime story does more than share a lesson; it prepares the reader for what lies ahead. I’ll warn that the novel pulls no punches. You’ll be drawn in by beautifully written characters, and will have your heart broken shortly thereafter. The novel opens up with a darling brother and little sister, both of whom you’ll love. The brilliance of the novel is that their tragedy at the beginning sets off a ripple of effects for generations to come. It was the most profound case of cause and effect, as family members remained touched by the heartbreak for so many years. Aunts, Uncles, caregivers, children, and children’s children were impacted by what happened at the novel’s start. If anything, this is among the most difficult of life’s lessons; that certain events have the power to affect families across generations. You can’t run from the past. I have to confess that I found novel’s first characters the most compelling. While the stories that followed were brilliant, I always longed to return to ten-year-old Abdullah and his three-year-old sister Pari. I found myself more invested in these two children, and no matter who was introduced afterward, my need to hear their continued stories only grew. Walking with them through their childhoods, adolescence and adulthood held more emotion for me than the rest of the people in the novel combined. And while I understood that the stories that followed Abdullah and Pari were forever linked to the children, I selfishly just wanted more from the original two. That’s not to say that the post-stories were not compelling or beautifully written. They most certainly were, and the same level of attention was paid to the characters that followed. For me, however, the lives of Abdullah and Pari were the most precious of the novel. I wanted happiness for them at any cost. Without giving away the close of their stories, I will say that I understood the end. The fact that not everything comes neatly wrapped in a bow may not comfort you, but this version of closure can at least offer some peace. While this book did not necessarily whisk me away with the ending that I greedily wanted, it did give me pause. I admire and respect the emotion of the novel’s close, and appreciated its confident look forward. Not only can the past affect you, but it can also provide a springboard for true contentment. Sometimes, I let my need for literary vindication take over, rather than allowing the novel to guide me through a natural karma-laden path. And The Mountains Echoed was just that. Love, spirituality and a smattering of karma. Beautifully done. 4.5 stars.